EVERYBODY KNOWS is a Spanish language drama from Academy Award winning director Asghar Farhadi about a family grappling with the kidnapping of a young teenage girl. Sometimes gripping, but often droll, EVERYBODY KNOWS isn’t the thriller you expect it to be, though the performances are terrific. Strong caution is advised because of strong foul language. EVERYBODY KNOWS is a Spanish language drama from Academy Award winning director Asghar Farhadi about a family grappling with the kidnapping of a young teenage girl. Sometimes gripping, but often droll, EVERYBODY KNOWS isn’t the thriller you expect it to be, though the performances are terrific. The movie opens with Laura (Penelope Cruz) arriving in a Spanish town with her two children, the free-spirited teenager Irene and young son, Diego. Laura’s husband, Alejandro, had to stay home in Buenos Aires to conduct a job interview. The occasion of the visit is that Laura’s younger sister is getting married, so all the family is in town to celebrate. One of the friends Laura sees is Paco (Javier Bardem), one of her old flames who’s now married to Bea, who runs a successful vineyard with his wife. Everyone’s happy to see each other. Even Laura and Paco who are very friendly, despite their past history. On the night of her sister’s wedding, Laura puts Irene to bed because she drank too much wine, but the festivities continue. Later in the night, Laura notices Irene isn’t in her bedroom, and she can’t find her anywhere. Eventually, more people are made aware, and everyone is searching for Irene to no avail. Some time passes, and Laura gets a text message saying that Irene’s been taken, but they’ll kill her if they call the police. Naturally, Laura is completely distraught, as well as the extended family, on what to do. Paco takes a vested interest in trying to find out how and who might have kidnapped Irene. As time passes by, the family becomes divided on whether or not to call the police. The kidnappers demand 300,000 euros, an enormous fund that nobody in the family has, except for Paco, who could get the money if he sold his vineyard. It’s revealed the Paco isn’t even part of the family. He used to be the son of one of the servants to the family and bought the land that he now owns from Laura for cheap. The family has secretly resented Paco for this, especially now that they have no wealth. Will Paco be willing to sell everything to save the daughter of the woman he once loved? EVERYBODY KNOWS isn’t a typical hostage thriller. It’s more of a social study on how family’s react when under duress. Director/Writer Asghar Farhadi comes back to this type of storytelling time and time again, first with the Academy Award winning movie A SEPARATION, which looks at a couple getting divorced in Tehran, Iran and the social difficulties that presents. His next movie, THE SALESMAN, looks at a couple unraveling after a stranger invades their new apartment and assaults the wife. So, if viewers are excepting a RANSOM type storyline of a parent willing to do anything to find their child, this movie isn’t it. However, for the story it’s trying to tell, EVERYBODY KNOWS is pretty good. 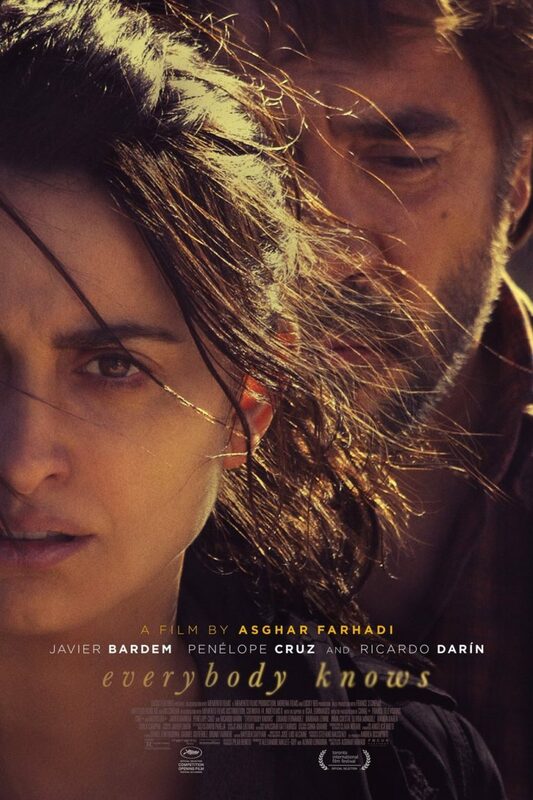 Penelope Cruz and Javier Bardem, a real-life married couple, are terrific in their roles. Farhadi’s use of movement in shots keeps things from dragging on too long, and his unraveling of complex family relationships is often masterful. The major problem in this story is the unsettling feeling that characters simply aren’t doing enough to save the girl. Eventually, the conversations become repetitive. There’s no “on the nose” message in EVERYBODY KNOWS. As everything unravels, the viewer can easily deduct that lies destroy relationships. Family, while messy and sometimes very complicated, is still upheld as important, and families need to fight for life, even if it means giving up everything to save someone. Alejandro is also convinced that God will save his daughter Irene, since God had saved his own life from alcoholism when she was born. In the end, EVERYBODY KNOWS is an adequately engaging foreign-language movie, but it falls short of being a great one. Strong caution is advised for strong foul language. A woman almost got an abortion. EVERYBODY KNOWS is a Spanish language drama from Academy Award winning director Asghar Farhadi. An extended family arrives in a small Spanish town to celebrate a wedding. Laura, played by Penelope Cruz, shows up with her teenage daughter Irene and young son, Diego. The night of the wedding, Laura puts her children to bed, but hours later Irene is gone and Laura can’t find her. She receives a text saying Irene’s been kidnapped, and the kidnappers are demanding 300,000 euros to return her safely. EVERYBODY KNOWS isn’t a typical hostage thriller. It’s more of a social, psychological study on how a family reacts when under duress. For the story it’s trying to tell, EVERYBODY KNOWS is pretty good, with a great performance from Penelope Cruz. There’s no “on the nose” message in EVERYBODY KNOWS. As everything unravels, the viewer can easily deduct that lies destroy relationships, and the importance of family is upheld. In the end, EVERYBODY KNOWS is an adequately engaging foreign-language movie, but it falls short of being a great one. Strong caution is advised for strong foul language.